Before trimming dog MUST be combed, bathed, and thoroughly dried. Show dogs must be bathed a day before every show and in regular intervals between shows preferably every 10-15 days. Frequent bathing will remove oils from the coat, so the tools we use must be of especially good quality. Dilute shampoo in a water bottle that you can squeeze to distribute the shampoo into the coat to the skin. You can condition the coat every other washing but be careful not to over condition. Stand your dog on the grooming table and wet him thoroughly with warm (!!!) water. Next start soaking sections of hair with the diluted shampoo and squeeze and massage it into the coat. Part sections of hair to see that the coat is wet and soapy to the skin. Put some shampoo in your hand and rub it through the hair on the dogs muzzle and between his eyes being careful not to get soap in his eyes. Be sure so soap the hair under the ears well as this area can become very greasy. Next rinse out the shampoo thoroughly, rinse and rinse again until the water runs clear and no suds appear when you squeeze a section of hair. If coat is very dirty you can repeat again. Every other washing apply conditioner and wait a few minutes then rinse again. If you will be showing your dog rinse all conditioner, if not you can leave a bit on the coat. You can now give you dog a break and let him shake and potty they put him back on the grooming table. You can use towels to remove some of the water from the coat. Use the towels to remove most of the water from your dogs face and inside and under his ears. Use a blow-dryer to dry the coat. Use a cool air blow dryer designed for drying dogs. These dryers are powerful and blow cool to warm air and will not burn your dog or his hair. Start drying at the top of the shoulders and down the back. You will see water spraying off of the coat and will be able to feel when it is dry. When you dry around the ears protect the ear opening with your hand so that air does not blow in the ear. Always work from top to bottom and from front to back so that you aren't re-wetting the coat as you dry. Dry the back first (upper part of the neck, back and croup). Next dry the lower part of the neck and left flank, after this; belly, right flank, forequarters, backquarters and tail. The hair between the toes can be dryed upwards. Lastly dry coat on the head (blow this forward from the back of the skull towards the nose). When the coat seems dry go over it again and comb while drying. You will see water spray again as water will come out of the dogs pores when he shakes making his hair wet again. When dog is completely dry you can brush and comb again. Start with brushing all of his coat and then comb it thoroughly. You don't want ANY matting. Start combing the furnishings on the hindquarters, lift the hair upwards with one hand, and comb the hair below your hand down to the skin keep moving upwards until all of the hair has been combed. Repeat this on all four legs. Be sure to comb through the hair between the legs but be careful. You don't want to break the hair off. Hold the tail up and let the hair fall downwards. Brush through the tail hair removing any tangles. Keep brushing through the tail until you reach the tail set. Next brush the back from croup to neck and flanks from belly to back. Remember to comb carefully under the armpit. Last forequarters, neck, under and behind ears and head. Now cut the nails and clean the ears. Use your nail cutter and clip the nails just short of the quick. Be careful! Next use your dremel tool to sand the nails down slightly so that they are smooth. Don't forget to trim the dewclaw. 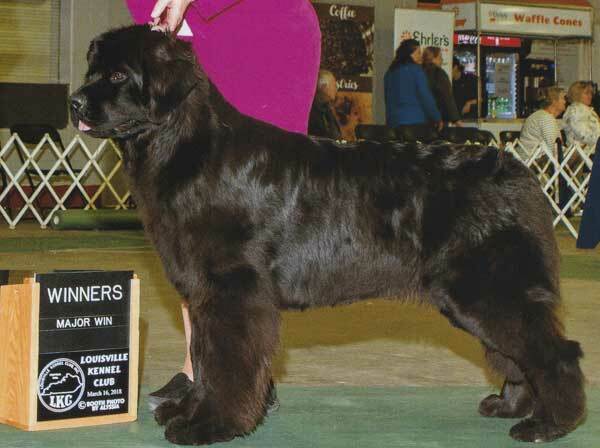 A Newfoundland, should have medium length coat, without over-long and wispy bits of hair. A groomed dog MUST still have a natural appearance, be careful and don't leave visible cut marks! Start with the paws of the forequarters. First under the paw, cut hair that grows between the pads even with the pad. Lift the hair between the toes combing upwards and cut using curved scissors making a nice round foot, but don't cut to much. Nails shouldn't be visible. However if you cut too much - don't worry, hair grows quickly on the feet. The rear part of foot hair must touch the ground with a gentle curve blending upward. Cut in the same manner the hair on the feet of the hindquarters. Change scissors to thinning shears and from now on use only these shears and a comb. Cut only in the direction of hair growth, never upwards - comb the hair in the section you want to work on and cut, comb and cut. Cut the coast of the entire dog in this way. Slightly even out the feathering. First on the back part of the leg, next outside and inside. On the inside cut more if the dog has a narrow chest, but don't exaggerate! Front legs must appear to be an extension of the shoulder and upper arm. No over-long hairs - especially on the elbows! Trim all undesirable whisps of hair on the shoulders and upper arms, also, to make "clean" lines. Same rules as with forelegs, look from behind and trim hair downward from croup to feet. Inside cut more if dog moves close behind, less if moves right. Looking from the side watch the angulation, cut excess hairs under the knee (stifle) and hock. Because Newfoundlands must have short heels (hocks) trim hair starting from the hocks downward in an angle of 45°, and lower part vertically to the ground (look at the picture below). Hair on the chest will often grow too long and needs to be trimmed quite a lot. Especially on the throat be sure to trim carefully. If the hair below the breast-bone is very long it will give the illusion of short forelegs, so trim long hair making a soft curve. Trim excess hair on the sides downward from ears to the breast too. Start from the back towards the front, first left flank, next right flank. Trim hair on the belly and breast starting from hindquarters to the armpit. Don't cut to much giving the impression of too long legs or cut to little resulting in too short legs. Take up foreleg and trim under armpit connecting line of chest with underline. Repeat it with second foreleg. Now look at the body of your dog in the breast section. The shape of the outline should be rounded to the flanks. Before After Not Like This! Trim more behind armpits, if you don't in movement hair that is too long will be visible. Sometimes it doesn't need any correction and sometimes hair on the neck and croup is very thick so it seems the dog has a mane and is to high in the croup. Here don't use scissors instead use the dematting comb to eliminate the excess undercoat. Trimming the tail is not always necessary , only if it has the shape of a flag. Start with the ears. Trim hair until it doesn't project past the edge of the ear combing always downward. Tip of the ears must be rounded not pointed. Now under the ear. Trim all greasy hair growth under the ear, trim the hair that grows on the cheek and where the ear lays. Often behind the ears grows soft over-long hair that detracts from the shape of the head. Trim it downward from earset. Now hair on the top of the head. Comb it upward and trim to obtain a rounded shape. Stand the dog on the ground and ask someone to move it in a gait. You will see the parts that may need correction. A very special Thank You to Iwonna Salak of Logrus for this information on grooming!